Jenifer Francis postulates a weakened, stagnant jet stream. James Hansen postulates an energized super storm jet stream. They can’t both be right ( but could, of course, both be wrong ). But the settled science crowd doesn’t seem to even grasp the contradictory claims as long as one can support a notion of disaster. Most of the floods have involved rainfall of more than 30cm a day for at least some areas. CONUS: Slightly warmer, slightly more moderate rain. Head for the rooftops, Mabel! Climate Scientology. Another good commentary by Alex Epstein. The Diciccio paper on ethanol biofuels got a lot of skeptical exposure recently (e.g.GWPF, WUWT). Its very wrong, and the specific problems as usual can be dug out of the SI. Commented extensively on it over at WUWT with a ground up verifiable recalculation. Corn ethanol cuts CO2 maybe 20% on an annual basis depending on pristover, plus distillers grain and resulting manure assumptions about annual corn cropland carbon sequestation. Of course, if the accounting is multiyear then the result is a net increase in CO2. No long term land carbon sequestration in stover plowed in, manure spread corn fields due to following summer bacterial action, plus CO2 from N fertilizer made from Methane plus diesel CO2 from farm machinery and transport. Ethanol up to the 10% blendwall makes sense depending on season and location. 10% is summer in LA. Ethanol boosts octane (meaning more gas can be refined from a barrel of crude), and is an oxygenate that reduces tailpipe smog contributions. Nothing to do with CO2. Anything more than 10% (E10) is farm lobby greenwash. I agree with Rud on ethanol use at ~10%. What the naysayers of ethanol absolutely refuse to acknowledge is minimum octane requirements for gasoline. In addressing octane requirements, anti-ethanol folks would have us follow North Korea of Afghanistan to return using lead? Or — we should forget legal precedents where MTBE is banned? Or — how about the use of benzene, toluene, or xylene?, after all concerns on things like cancers are way overstated. Yep, we should forget all of the above (and more) and accept papers like the one cited by Dr. Curry — funded by the American Petroleum Institute. I believe that growth in ethanol above the 10% blend-wall (for minimum octane requirements) should be market driven by : (1) Exports; (2) the next generation of fuel efficiency engines (turbo charging) requiring high octane requirements; (3) a lower (effective Btu) market price of ethanol than gasoline. Nope. The sat alt stuff is off. See essay Pseudoprecision. I commented here or at WUWT on this concerning the closure problemnot long ago. Diff GPS vertical land motion corrected long record tide gauges show ~2.2mm/year per Moerner’s most recent estimate. Sat alt shows ~ 3.4. Since SLR is the sum of ice mass loss plus thermosteric rise (the groundwater argument is deminimus), then estimates of those two primciple components must about equal any estimate of SLR. It does for 2.2. It does emphatically not for 3.4.
ristvan ???? I agree with your noting the those differences. I don’t see how that applies to the differences I pointed out – which were components – not the Total differences. DH, I suspect we are in ‘violent’ agreement. The perhaps not well expressed thrust of my reply to your comment is that THERE ARE NO OTHER principle components to SLR as the article postulates. So the Zwally Antarctica stuff plus the revised diff GPS GRACE stuff just show a systematic error in the sat alt SLR. Warmunists do not want this exposed, since when they append sat alt to tide gauge (hiding what tide gauges show thereafter) they can point to SLR acceleration–using a direct equivalent of ‘Mike’s Nature trick’. Regards. This report on Zwally’s work is from a year ago. It made for a lot of discussion on the difference in ice volume estimates between satellite gravimetry and altimetry. For sticking to his results Zwally found himself suddenly attacked by his alarmist buddies and defended by skeptics. There is a very interesting two part back story on this told by McIntyre over at CA last year? I am going from memory, so may not be exactly right. 1. The Zwally ICESat analysis was available in 2012 before AR5, but not published until 2015 well after. Ummm…no pressure. Nope (sarc). 2. The previous sat GRACE estimates of ice loss depend critically on GIA adjustments. All the GRACE published estimates until 2013 depended on GIA models. In 2013, actual differential GPS coastline estimates of Antarctica GIA were published. The modeled estimates were about 4x high. When the ‘new’ observational GIA is plugged into the GRACE data, GRACE essentially shows no ice mass loss over its mission history. Another model fail creating undue warmunist alarm. This incident is a perfect example of the modus operandi of the warmisterium. I never believed amazing GRACE stories of Antarctic mass loss while surrounding sea ice is growing and SSTs falling. Now they are exposed as fraud. Repetition Is good, since the warmunists trashed Zwally, and never noted either the corrected GRACE estimates supporting him or McIntyre’s ceitique of early GRACE based on the corrected GIA. Now more denizens know the ‘truth’. The bottom of the article says “Last Updated: Aug. 18, 2016” No idea what was updated. Zwally was not trashed. He correctly predicted how his work would be abused and by whom. bias is a survival skill bestowed upon thee by Gaia. Natural as the methane produced by a polar bear after a fresh seal brunch. Embrace it. Clever how that happens when rising GHG’s are modeled to increase positive NAO/AO, while AMO and Arctic warming are negative NAO/AO driven. Rising GHG’s have had little effect on the natural AMO and Arctic warming cycle since 1995, and if they do marginally increase positive NAO/AO, that would tend to increase intensity of the next cold AMO phase. Re: More great news for climate science in Australia. Dr John Cook gets a new job at George Mason University. Brought to you by the same crowd that pushed for RICO suits against skeptics. Given the innovation and rigor of John’s climate communication research – and his total commitment to helping stabilize the earth’s climate – we are fortunate indeed to be welcoming him to America, and to have him join the 4C team. The issue with climate model is that they are robots, they are not simulation computer programs. They drive the climate without knowing what is the actual driver. The mathematical model prevents these mistakes from occurring. I think this important point has been missed by the authors. I am in Agriculture. As such, I react with puzzlement here at CE where increased greenhouse gases effects on plants are discussed. (1) On one hand people (like Dr. Curry) emphasize the “Wicked Problem” with Climate Change — where a simplistic approach of “CO2 Only” isn’t warranted. (2) But in Ag — here at CE, the possible existence of also “Wicked Problems in Agriculture” just don’t exist. For example, any Farmer knows about things like “the law of limiting factors”. To believe that increased CO2 is simply plant food and the more the better just isn’t correct or inquisitive. Its a whole lot more complicated than this, yes a “Wicked Problem”. Stephen, “To believe that increased CO2 is simply plant food and the more the better just isn’t correct or inquisitive. Its a whole lot more complicated than this, yes a “Wicked Problem”. A wicked problem is supposed to be due to the complexity of the problem itself not the inability of the problem solvers. If you have actual evidence that atmospheric CO2 greater than X is detrimental for general agriculture, try producing it. Why? Every time I present information from say, the prestigious Stockholm Environmental Institute you’ll either just say its wrong or there will be silence. The vast majority of Commentors on the CE Blog don’t want to look for common ground — they just want to fight in binary terms. Same ol’ same ol’ if CO2 reduces the need for as much water then plants will uptake less nitrogen and trace elements they get from water uptake through their root system. So if you get roughly 10% reduction in irrigation needed you get about 10% less gluten in wheat. That is bad if you want high gluten wheat but good if you want bigger yields with less water. Most of the studies though are based on model estimates using the exaggerated BAU scenarios and some weird assumption that “pre-industrial” was agricultural Utopia. Actual CO2 levels drop significantly over a field during growth so if you “force” a constant 560 ppm you are more likely simulating something closer to 700 ppm. In other words, the test results are likely biased to the negative side of things and still show mixed benefits. 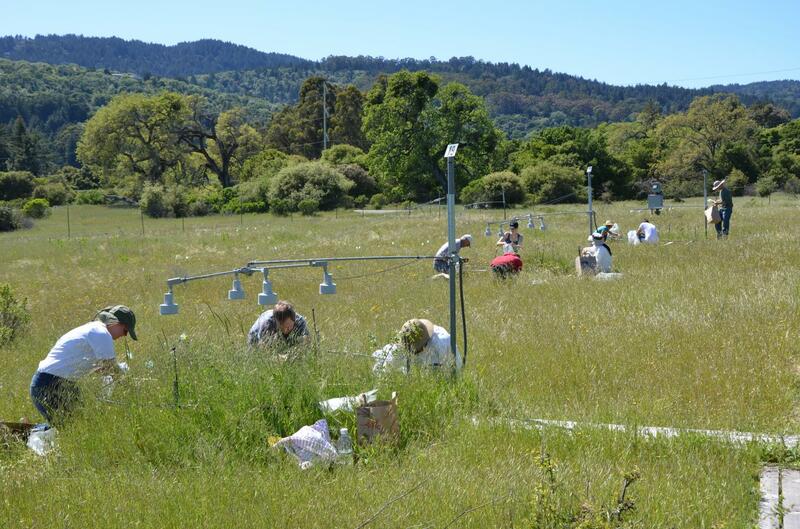 The biggest surprise from the study was the discovery that elevated carbon dioxide only stimulated plant growth when nitrogen, water and temperature were kept at normal levels. The referenced paper is so daft I don’t know where to start with it. It is typical warmunist propaganda. i have crabgrass, blue grass, and fescue in my lawn, and temperatures and precipitation determine who is winning at any time of year. California grasslands? Really? I didn’t know California even had natural grasslands. “The three-factor combination of increased temperature, precipitation and nitrogen deposition produced the largest stimulation [an 84 percent increase], but adding carbon dioxide reduced this to 40 percent,” Shaw and her colleagues wrote. California, most of it, is in a drought. Stanford is in the San Francisco area (20 inches/y precipitation). 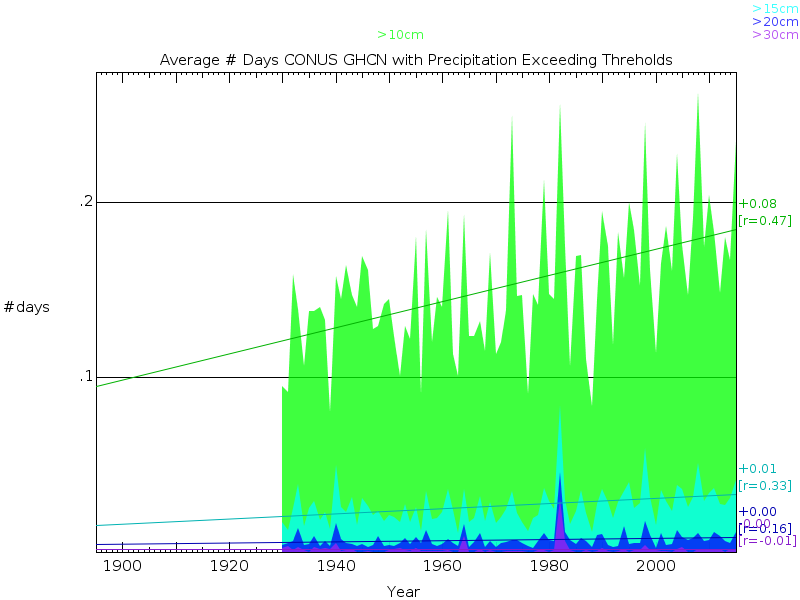 Since the 50% more precipitation isn’t likely they appear to have been shopping for problems. Further this is from 2002. There have been allegations that the CO2 plots were located in a phosphorus deficit part of the test field. Gee, that looks real professional. Given the number of “more CO2 is better” studies since this one came out real scientists would have studied why this experiment is an outlier and fixed it. Funny isn’t it. Forget all the controlled studies in green houses and jump on the “creative” field studies with the results you expect. Hmmm, 40% increase in tuber yield under high CO2 conditions. Thank goodness I am a potato kinda guy. This is incorrect. It is a nice problem and there is nothing wicked about it. 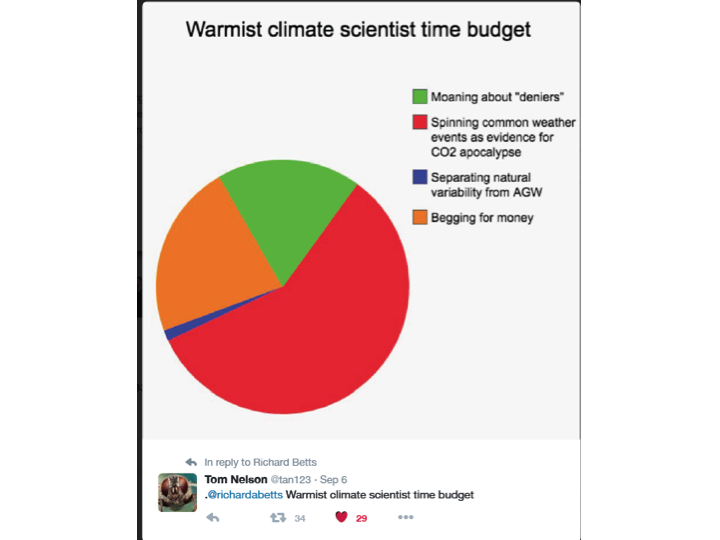 Further, the warmunists frenzied efforts to dance around the beneficial nature of CO2 are just embarrassing. The CSIRO 1982-2010 study indicated 11% more growth globally. CSIRO made no allowance for deforestation (the brownish spot in Africa is Tanzania that converted 30% of the forest to firewood during the period). The low/negative growth areas match known areas of deforestion/land use change. The exceptions that I’m aware of are central Australia (which has little ground cover) and central Alaska. 10% of wilderness globally was lost in just the last 20 years (per a study reported in Current Biology). A lot of ground cover went bye-bye. The global increase in average plant growth was the CSIRO 11% plus the roughly 14% of wilderness (using the Current Biology study as a guide) lost during the 28 year study period. The 1982-2011 growth increase in pristine and same use areas would presumably be more than double the 11% CSIRO study estimate. Further, until we get to 1200 PPM more is better, period. We have to get to 750 PPM for C3 plants to be on equal footing with C4. Further, more CO2 decreases water consumption which is a major limitation on food production. About 90% of human water consumption is for irrigation, without more CO2 people will increasingly have to chose between drinking water and food. CO2 isn’t simply plant food – it is better than that, it is a planet saver. it is a planet saver. Lol… on our American family farms, we produced bumper crops… starting in 1620. We did not need any extra CO2. 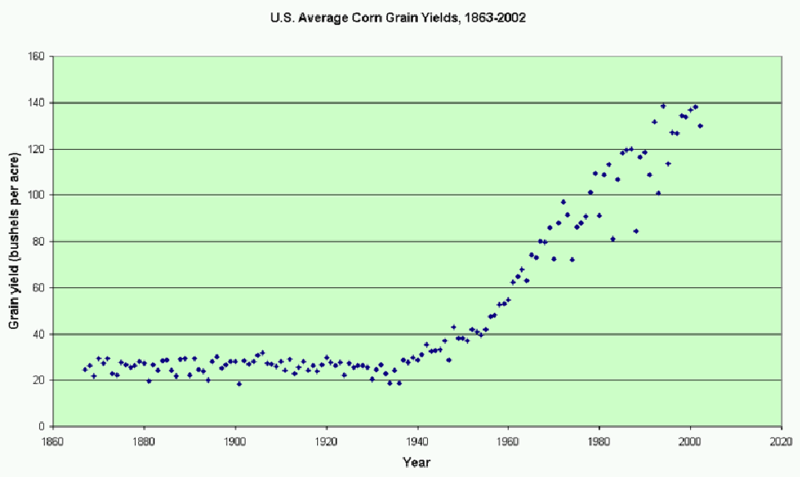 Wasn’t “bumper” yields per acre quite a bit lower back then? Correlation is a tricky thing. JCH: Lol… on our American family farms, we produced bumper crops… starting in 1620. We did not need any extra CO2. Yes, well in 1620 lots of people survived into adulthood without vaccines — nevertheless, vaccines are good on the whole. Yes, go back to 1620 crop yields and the world is suddenly starving. It’s confirmation bias that doesn’t allow those in love with CO2=disaster narratives that prevent them from accepting the obvious fact that they are carbon based life forms, alive only by the fact that plants photosynthesize airborne CO2, a process which increases when CO2 is more abundant. You’re hilarious. Ever here of seed companies? Happened since 1620. Ever hear of pesticides? Happened since 1620. Ever hear of the plow? Happened since 1620. Ever hear of anhydrous ammonia? Happened since 1620. Ever hear of no-till farming? Happened since 1620. Ever hear of herbicides? Happened since1620. Ever hear a farmer pray for more CO2? No. If a farmer’s prayer for rain didn’t work, praying for CO2 might be a fallback. Ever hear of the plow? Happened since 1620. Ploughs were recorded in the Domesday book in the 11th century. On upland dartmoor the highest farmed land were recorded as having enough land for two ploughs. At that time the land could be farmed to a greater height than it can now. Geological evidence is that the biosphere was much larger in past, suggesting we are far from hitting limits globally. Biosphere growth is accelerating. Sure, we should wonder about maybe outpacing supply of trace nutrients and local supply, but globally, and given the likely limits to how fast we can consume fossil fuels, it is only plausible we could hit limits to biosphere growth in the sense that anything is possible and nothing is certain. Don’t forget, those other nutrients are also down in the ground, often in the coal and oil themselves. Something to think about, but not a big worry. I wasn’t aware that only “real” ag scientists published in Nature Climate Change. I guess I am behind the times. The guys at UF must be part of the deplorables basket. More CO2, more photosynthesis, more carbohydrates less water requirement. Pretty simple really. Warmer temperatures might require changing planting schedule or changing cultivar. Captain Dallas — Your article exactly makes my point. Dr. Curry says all the time “that all things being equal, that CO2 will increase temperatures”. She goes on to say “the problem is that all things are not and do not remain equal” — “We have a wicked problem”. Incredulously, you and others want to include “other things” besides CO2 in the Climate Debate. But with crops, nope you only want to look at CO2 (ignoring things like findings such as the detrimental nutrient impact on rice with increased CO2 which I’ve posted here). Timg56 — Its people like you that make it very difficult to always try and take the high road here at CE. When have you ever provided anything of substance? The answer is never. But according to people like Timg56, this type of research should be burned! and anyone citing them should be called names. At least in the comment section — CE is not an objective cite. Except with the exception of Rud, I doubt that any of the “expert” Commentors at CE even know what the “law of limiting factors” means in Ag. I did, at the high end of estimates, that would be over 8 degrees F in the tropics which are warming at a lower rate than the 30N to 60N region, there would need to be some adaption to temperature. So you need to make up your mind about what catastrophe you are concerned about since RPC 8.5 appears to be highly unlikely and 2.25 F of warming per doubling skewed the higher latitudes during winter won’t have much impact on crop production. CO2 fertilization offsets some of the need for adaption. That study like most is biased to a worse and probably unlikely case. Now if you think 10F of warming in the tropics is highly likely, it is too late son. Might as well eat drink and make merry because such are the fruits of over hyping. You are probably right, I just know that it is September and time to set out tomato plants if I want them to set fruit. Once temperatures get too high, mainly night wet bulb, the dang things don’t set fruit here in the tropics at sea level. Don’t matter how well I tend them. Captain Unlike you, I’m inquisitive and being in Ag, I know AGW/CO2 is a wicked problem in understanding. Its not a binary subject as you (and others) want to make it. No, not binary, SS. Just one of many similar attempts to get the warministas to consider the benefits of CO2. Stephen, “Unlike you,” I am not into making a problem more wicked that it is. Additional CO2 is not going to be a limiting factor. Additional temperature will be a limiting factor in some areas and a reduction in limit in others. Depending on the timing of the increase in temperature, one would need to adjust planting time, warmer winters would increase overall growing season making that practical. In spite of all the science involved, guessing when to plant is a bit of a black art and guys using the old farmer’s almanac are doing about as well as the guys using long range forecasting. Crop insurance is still a good thing in spite of your choice. Get real, SS. On their face, the studies are worthless; No consideration of CO2 or precipitation influences. As Charlie Skeptic avers: Any reliance on models for “projection” of future temperatures is an automatic fail. Captain — So when I post a study, say discussing CO2 and C3 and C4 plants, according to you and timg56 I’m just being a “clown” and an Alarmist CAGW type. We have thousands of Research Ag Scientists trying to understand this topic (which many of us consider wicked). Over and out — trying to provide objective thought (where I don’t have all the answers like you do) is throwing pearls to the swine. I’m a porcine rooter for morrells of truth. I’ll take, however, any any of your pearls relating to the validity of climate model “projections” that seem to concern you and many others so much. No, I just think you are being a bit irrational. 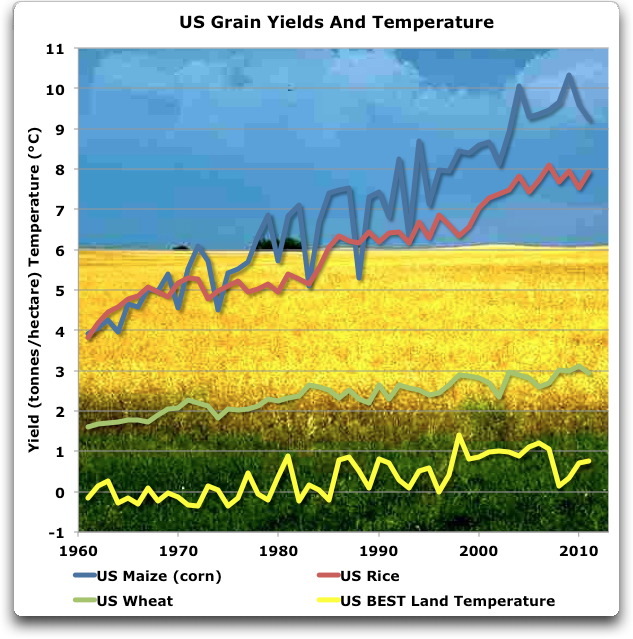 CO2 and Ag is a Ternary problem, good, bad neutral (mixed) which isn’t a “wicked” problem. As I said, most of the papers use the extreme range of projections and find mainly mixed results. The Rice paper is an example, if the worst case happens, it will be more difficult to grow rice where many now grow rice using the methods they now use to grow rice. Other than the worst case, CO2 is mainly beneficial. Now if the worst of the worst cases should happen, there will be a host of other much more pressing issues than maintaining a predominately rice diet. Some people may have to acquire a taste for sweet potatoes perhaps, they will yield bumper crops in a warmer climate with more CO2. Kinda neat that sweet potatoes are a “super food” isn’t it. I thought you said you were in energy generation. And before whining about how no one takes you seriously when you link to “science” papers, try evaluating the material first. When the paper is using mostly model output, it is probably as “scientific” as predicting this year’s Super bowl champ based on research you conducted using your Xbox and Madden NFL 2016. By Michaels & Knappenberger. Now available in an inexpensive paperback. Excellent, non-technical but detailed. but it will not make a difference now. “Permafrost carbon-climate feedback” Another prediction of catastrophe in a couple of centuries. No way to prove any of it, however. Let this be a test of your skepticism. Can you find the obvious piece that has been left out? Gee. I wonder why Epstein left that out? One can understand Epstein being a tad defensive when the government of his country has practically declared war on his industry. So, they made him do it? NOAA would pass Grade 6-8 – but fail to meet the Grade 9 – 12 standard. Well, I’m sure if the climate had been in an ice house, the floods wouldn’t have happened. So, obviously, climate change had an impact. Corporate speech is not speech. Hate speech is not speech. Now, You can’t say that on campus. When people went along with the idea of hate speech they were setting up future sacrifices such as what we are seeing now. TMG was informed that we agree with their 1998 report. This is not big question but I wonder. You really mean Zwally’s paper and not more recent one of Previdi? Your weekly list are valuable for me. Thank You.